Free Computer, Mathematics, Technical Books and Lecture Notes, etc. Flight Visualizer, track your favorate flights/aircrafts in real time! 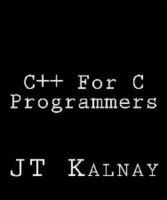 A textbook of C++ examples intended for C programmers. This book is not a starting point for new C++ programmers who do not know C. It is a transition tool for C programmers. JT Kalnay wrote C, C++, and Assembler programs from 1979 until 1995 when he decided to become a patent attorney. He still dabbles in programming, but spends more of his time writing novels about programming mistakes (e.g., The Pattern).